The observation platform at this popular family friendly site was constructed to allow viewing of manatees, one of Florida’s most iconic mammals. 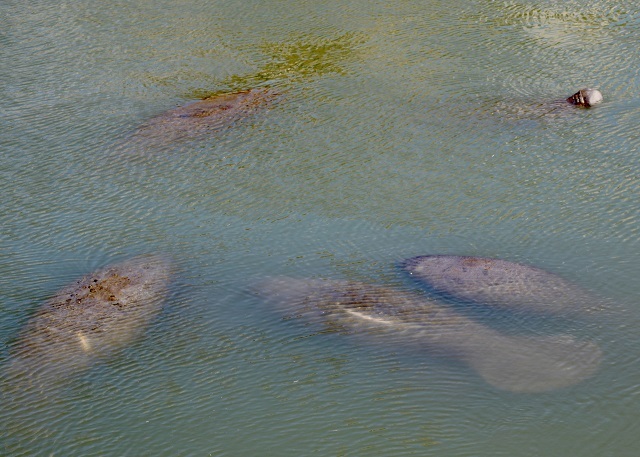 Up to 300 manatees spend the winter resting and feeding in the shallow waters, especially when water temperatures fall below 68° F. They are drawn to this designated state and federal sanctuary by the warm water emerging from the utility plant. Manatee and bird watchers alike love the 900-foot, ADA-compliant boardwalk that runs through the adjacent mangrove forest; it creates an excellent vantage of the mudflats where shorebirds and wading birds congregate. The shallow waters are perfect for viewing spotted eagle rays, which jump completely out of the water from time to time! southern stingray, cow-nosed ray, crabs, fish, and other aquatic creatures can be observed here too (polarized sunglasses make spotting them much easier). Groups of more than 30 are encouraged to make reservations by calling (813) 630-7146. Stop by the environmental education building, which has manatee exhibits and displays. Don’t miss the butterfly and native plant garden as well. In the southwestern corner of the parking lot, across from the vehicle entrance, is an interpretive trail (open 10 AM to 4 PM) that winds past salt flats, salt marsh and coastal strand.